I'm starting a new cause, which is a worldwide Christian movement titled Project A-List. There is also a Facebook page available, with updates coming within the next week. Please support by liking and/or subscribing. Project A-List is a worldwide movement that seeks to expose Hollywood celebrities (actors, actresses, musicians, directors, producers, etc) to the gospel message of Jesus Christ. 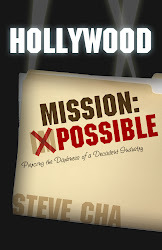 The goal and vision of Project A-List is simply to bring salvation and sanctification to as many celebrities as God wills, and to unite a wide Christian community that is willing to participate in personally leading Hollywood stars to faith in Christ, as Steve Cha and Jonathan Khan did in the book, Hollywood Mission: Possible. Pray. You pray for the salvation of certain celebrities (ex. Rachel McAdams, George Clooney, Quentin Tarantino) whom God placed in your heart. You ask the Lord for opportunities to seek them out so you can personally evangelize them, or you ask God to send messengers who will come into contact with these prayed-for-celebrities and preach the gospel message to them. Seek. You seek opportunities to find these celebrities, or at least be on the lookout for them wherever you are in a given moment, for the purpose of evangelizing them. Consider taking on entertainment industry jobs that will place you on movie/TV sets with these celebrities so you can meet them. Follow-up. Come into contact with these celebrities again, either through phone contact, e-mail, or personal meetings. Continue to share and expand on the gospel message, providing whatever apologetic resources and/or encouragement they need in their search for God. If the celebrities give their life in surrender to Jesus and becomes Christian, continue to support and lead them in the ways and commandments of God, so that they can become salt and light to the entertainment industry and even lead other celebrities to faith themselves. Please support project A-List today by subscribing, following in on the announcements and news concerning media and Hollywood, and contributing to Project A-List with personal stories and important information on how to reach certain celebrities (casting calls, fan club addresses, celebrity sightings at certain time and location, etc).